Sella attacks at the base of Apica. He'll toast everyone for his third solo stage win! Emanuele Sella(Team CSF Group Navigare) did it again by winning his third mountain stage on Saturday in Tirano. He proved his worth of wearing the maglia verde with another impressive solo victory that took him over the famed Gavia pass. As you know, it's the same pass that launched Andy Hampsten, twenty year's ago, to be the only American Giro winner. 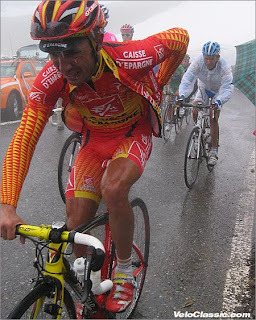 By the way, Andy was at the top of the Gavia giving out rain jackets to any needy rider. Talk about giving back! Sella's claim to fame is not only from winning mountain stages but how powerfully he attacks ... alone. Because of this the tifosi have called him, the next Marco Pantini. A fitting tribute to cyclings' climbing hero. Just like 'the pirate', Sella enjoys the mountains and knows when to attack. On top of the Gavia. Soggy third place finisher Joaquin Rodriguez(Caisse d'Epargne), wraps up in a rain jacket. Stages 14 & 15 was a prelude to his greatness. He almost made it 3 in a row on stage 16, the very tough Plan De Corones, ITT. Sella scampered up that difficult dirt track and nearly took the victory only 6 seconds behind stage winner, Franco Pellizotti(Liquigas). 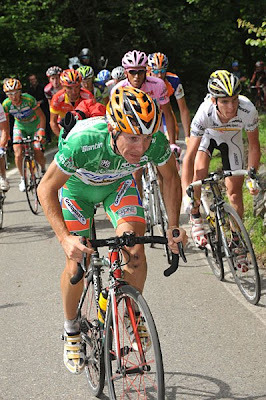 Today he decided to attack on the final climb, Apica. 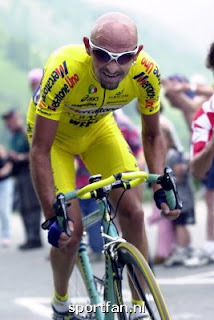 Sella rode away from second place finisher, Gilberto Simoni(Serramenti PVC) for the solo win. Sella's hold on the maglia verde is virtually untouchable. And wouldn't he be something in the Alps, of a future Tour? We can hope, as his lofty abilities looks, extremely majestic. Just like another special Italian climber! Not bad to be compared to Il Pirata!